PSYLAB SAM is designed to completely replace all functions of the previous PSYLAB frame system. 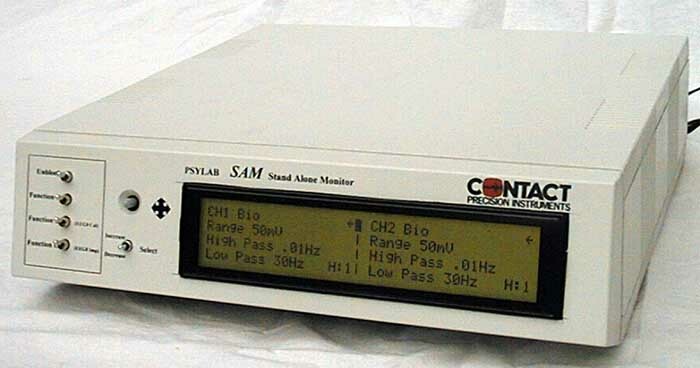 PSYLAB Stand Alone Monitor (SAM) allows connection of up to two measurement or stimulator devices and may be used as an independent stand-alone unit with analogue output for connection to any data acquisition system or recorder. It may also be configured to provide an integrated laboratory system via the USB interface which can talk to multiple SAM units in conjunction with PSYLAB software for Windows. is attached, it just will not work correctly until the correct selection is made. Devices are selected by pressing the ‘joystick’ control to move the flashing cursor on the LCD display to the device name shown on the top line of the display, then pressing the ‘select’ control until the required device is seen. Any selection made on the LCD display is retained after the unit is switched off. The same method is used to adjust other settings for each device shown in the LCD panel, such as gain, filtering etc. By selecting the arrow in the top right of each display side, other parameter display modes are obtained. Noise and Shock (pain and somatosensory stimulation). SAM may be used purely to control these devices in stand-alone mode, providing independent instruments for connection to other data acquisition or stimulus trigger systems using 3rd party software e.g. LabView, NeuroScan, MatLab, etc, or custom written programs. 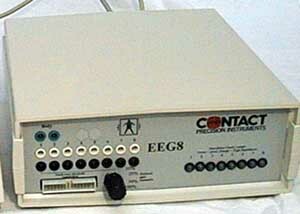 The stimulators may be externally operated using TTL logic triggers via the Event Synchronization port. straightforward USB port and control of amplifier functions. The event port at the back of each SAM allows control of external devices or receiving of synchronisation cues from them. Both hardware and software easily accommodate mixing of measures. Software provides control of the Event port outputs and also the Tone/Noise and shock stimulators. Other stimulation is available using PSYSTIM multimedia stimulus software. Small systems can be relatively portable if required, capable of working with a laptop computer via the USB port. They are light enough to be carried in a car and easily set up at a remote site. If possible the remote amplifiers may be positioned close to the subject. This reduces susceptibility to interference and improves safety as direct subject connection does not extend beyond the isolators in the amplifiers. Extension cables between the equipment and the amplifiers allow them to be positioned in a separate room if required, with the main equipment away from the subject. SAM units are powered by 12 volt universal power units which run on any voltage between 100 and 250V, 50/60Hz. A rechargeable battery pack and 12 volt vehicle cigar lighter cable are possible for truly mobile systems. Left: When SAM units are used via the USB interface, sychronization of data acquisition and stimulation is assured using proprietary technology. Multiple SAM units may be connected to a single computer via a USB hub. All SAM functions, gain, filtering etc. may be controlled from the computer by simply loading in a template file. Data acquisition, stimulation and analysis software is currently $995 per SAM unit.